Tea (chai in Farsi... and just about every other language) is a really important part of daily life in Iran. We drank tea with breakfast, and at our mid-morning snack breaks. We drank tea after lunch still at the table, and in the late afternoon with a small plate of sweets, sitting on a takht (wooden platform) in a courtyard. After dinner, when you might normally go out with friends for beers - we drank tea in hotel lobbies. 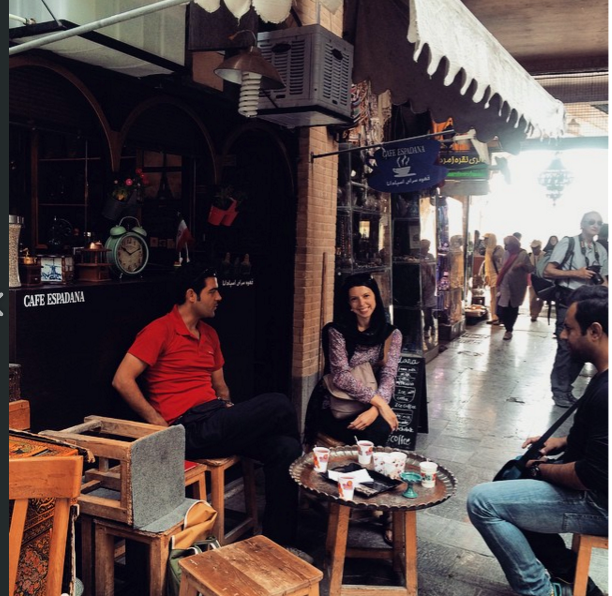 On one free afternoon in Isfahan, we wandered sort of aimlessly before settling in to a tea shop in the square. Sitting on tiny stools in a courtyard, we sipped this gorgeous tea full of flowers and herbs and who knows what, sweetened with rock sugar sticks, and watched life go by. We had several cups and must have stayed for an hour or two before we headed out to the square to do some more people watching in the sunshine, collecting new friends along the way. When the sun went down, where did we go? To another tea shop, of course! There wasn't a whole lot to do in Abyaneh, a small mountain village. So after a wander around town and a short hike, we all found ourselves back in the hotel lobby. We took off our shoes and settled on to the carpeted takhts. A huge samovar in the corner meant that tea was always at the ready, and they brought it out quickly along with these sweets made with chickpea flour to enjoy while we read, watched the news, or smoked the nargile. One of the tricks of salesmen in the bazaars is to ask where you are from - they draw you into conversation, and then say "come, my friend's shop is just over here, come take a look". Now, I normally avoid these conversations because I am cynical and cold-hearted and don't like talking to strangers - especially ones who want to sell me things. My friend Judith, on the other hand, is the sweetest and most open soul, and will talk to absolutely anyone. And so as we walked through the Isfahan bazaar one afternoon, we stopped every few feet for her to chat with someone new. I would usually walk ahead impatiently, willing her to move along, but once I got distracted by a guy who asked me if I was from Spain ("si, si!" I said... "you're not from Spain," he replies - my accent is clearly not lispy enough to be Spanish. I was able to convince him that I'm from Honduras, though.) Meanwhile, Judith has befriended a young guy who speaks excellent English. He invites us to visit his jewelry store, and she agrees so I follow her inside. We look at a few pieces and he flirts with her a bit before we decide to go. As we are about to leave, he invites us to have tea with him and his shop mate. You don't have to buy anything, he says - we just want to enjoy your company. Reluctantly (why am I always so reluctant? ), I agree - mostly because I love tea. They produce tea and these flat, round sugary discs from behind the counter. While we sip our tea, we wind up having a really fantastic and honest conversation about their views on the political situation in Iran and their hopes for the future. Our new friends even teach us how to say a few words in Farsi - "I am beautiful, you are beautiful, it is beautiful" (khoshgelam, khoshgeli, khoshgele).